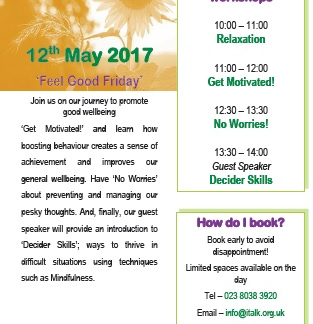 ‘Get Motivated!’ and learn how boosting behaviour creates a sense of achievement and improves our general wellbeing. Have ‘No Worries’ about preventing and managing your pesky thoughts. And, finally, our guest speaker will provide an introduction to ‘Decider Skills’; ways to thrive in difficult situations using techchniques such as Mindfulness.